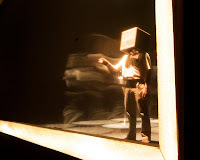 The original production of [boxhead] at the Factory Studio Theatre in 2000 still ranks among the top ten theatrical experiences of my entire life. As a fresh-faced graduate from theatre school, over-saturated in naturalism and starving for something different, the piece which tells the story of a young geneticist who awakes one morning to find that he has a box affixed to his head, was simultaneously unlike anything I'd ever seen and exactly the inspiration I needed as I was beginning to forge a career for myself as an artist interested in experimental work. Recreating the impact of an experience like that is virtually (if not totally) impossible to do, however when I was heading off to catch the new production of the show last week at Buddies I did everything I could to calm my expectations, lest I be let down by however this version would weigh in my mind against the previous one. The original creative team on the project has returned, through the O'Donnell and Paul Fauteux who originally performed the roles of Dr. Wishful Thinking and Dr. Thoughtless Actions respectively, have been replaced by Adam Lazarus and Andrew Shaver, both of whom throw themselves into their parts with gusto. The set design (devised by the team of Abraham, O'Donnell, and Naomi Campbell) is more or less the same, as is Steve Lucas's lighting. There have been small updates to the text (references to Stephen Harper, the current economic downturn, and the internet have been added) though the script is essentially the same. It makes sense that not much has changed as the show was essentially perfect the first time it was produced. At the same time, it just doesn't work quite as well as it used to. Criticism is an incredibly subjective thing, which is why I always go to great lengths to insert my personal experiences and prejudices into my writing, so that readers know where I'm coming from. The show blew me away the first time I saw it and this time it didn't, which I think is both a combination of the body of work I've seen in the last eight years of my life and some subtle changes that Abraham has made with this production. One of the subtle changes is a reduction in the amount of subtlety. The first production (though I think it was almost exactly the same length) seemed to give the actors a bit more room to breathe, alternating the firing-squad speed of the text with space for the audience to absorb what was happening. There were moments of quiet, moments for reflection, and space for us to think, which given how much the script asks us to think about is pretty important. In this version you can almost hear Abraham in rehearsal yelling "Faster! Faster! FASTER!!!" as the actors race through the text with such incredible speed it's frequently difficult to understand them. This is the third time I've seen the show and I still had problems understanding some of the text, so I can imagine how challenging this would have been for an audience member who was viewing it for the first time. Combining this with a slightly too heavy handed approach to the sound design (please turn the reverb down just a little bit!) and Buddies cavernous Chamber which is certainly not one of the best spaces acoustically in the city, meant that at times the text just became a sonic blur. With a different play I might not have had such a problem with this but the text, particularly the way that repetition plays in this piece, is so essential to the overall outcome, that making the sacrifice of adding an extra five minutes to the playing time would have been incredibly beneficial to the audience's experience of the work. Having said all that, I'd still recommend the piece to anyone. If you've seen it before, you may not like it as much this time. And if it's totally new to you? It just might end up on your personal all-time top ten list. [boxhead] plays at Buddies through November 2. I've been advised that there was a major technical malfunction at the show that caused some sound problems in the first 30 minutes on the night that I saw it. Not sure if there were other issues with the sound on other evenings, but I wanted to let readers know that I did not get an accurate representation of the true sound design of the show. Additionally, the panic that this caused with the actors had a pretty major impact on the quality of the performance. If anyone else saw the show on other nights and would like to comment, please do. i also found it supersonically fast and excessively reverbed for my listening abilities (and don't think we saw it the same night), but that seems to be what kids like these days ;-) still, a useful and fresh night. life lesson: don't remount a great show.